Before planning a party for a Sweet 16 birthday, be sure to talk with the birthday girl. Some teenage girls love the idea of getting dressed up and having a big party, while others would rather go to a movie with friends or spend the day driving around town. If she likes the idea of large and extravagant girl birthday parties, she can help with party planning ideas and deciding between birthday party venues. But leave some surprises for the big day: she’ll likely have more fun that way. A “night out on the town” is an ideal Sweet 16 birthday for many girls. This Sweet 16 party can combine a teenage girl’s love of shopping, concerts, luxury, dressing up, and fine restaurants, depending on the events chosen for the party. For girl birthday parties in a big city, consider preparing a lavish ride for the birthday girl. A limo is best; if it is too expensive, the family car can be decorated for her special day. Consider using washable car paint on the windows with phrases like “Happy Birthday !” or include other Sweet Sixteen decorations. The new sixteen-year-old and her friends can enjoy “champagne” cocktails of apple cider and pomegranate juice. Once at the city, the girls and their chaperone can go out to dinner at a nice or famous restaurant. While dining at a nice steakhouse or Italian restaurant will be fun for the girls, they may also enjoy doing something more unusual. Dim Sum in Chinatown and small plates at a modern restaurant are fun and out-of-the-ordinary party planning ideas that the girls will likely enjoy. After dinner, everyone can go out for a concert, play, or musical. All of the guests can dress up for the special occasion to feel like special guests at the show. Of course, check with the birthday girl first to see what type of show she would like to see. If the special girl is a bit more of a thrill seeker, consider planning a party to be held at an amusement park. Six Flags parks or similar parks are fun for teenagers, and even guests who do not like roller coasters can find something fun to do. While admission is fairly pricey, oftentimes theme parks offer deals on certain days, or put coupons in booklets or on soda cans. Also, a theme park is probably cheaper than a “night out on the town.” If the party budget is a real concern, consider eating lunch or dinner beforehand or have guests bring their own money for food and trinkets. If the new sixteen-year-old is more of a homebody, family-oriented type of girl, consider planning a party that includes her whole family. This is also a more budget-friendly type of Sweet 16 party. For a larger family, hold the party at a local park or at home. For smaller family celebrations, a restaurant serves as a nice change of scenery from ordinary family parties. 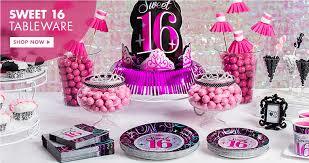 For the special day, try to get specific Sweet Sixteen decorations. While colorful balloons and streamers will add a nice touch, the celebration will feel even more special with decorations that have sayings like “Happy 16th Birthday” or “Happy Sweet Sixteen.” Sweet Sixteen decorations can help the party feel more like a once-in-a-lifetime event than just any other birthday. In addition to family members, be sure to invite her friends and anyone else she is fond of. Having everyone there to celebrate her sixteenth birthday can make the occasion very special. If the guest list gets too long, consider having an appetizers-only event or removing guests she is not as familiar with. For Sweet Sixteen gifts, get her something that she will really love. Nice jewelry, cash to help buy a car, and a mall gift card all make excellent gifts for a sixteen-year-old girl. Sweet Sixteen gifts can be more sentimental, but to be sure that she will use the gift, consider her interests first. The birthday girl is sure to have a wonderful day if any of these birthday party venues or party planning ideas are used. While a party may not be as exciting as getting a new car, it is something she will remember fondly for just as long.